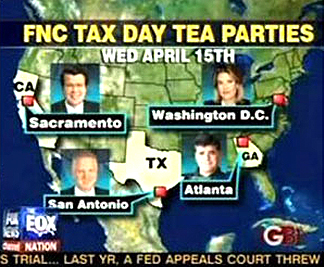 Rupert Murdoch Says Fox News Shouldn't Be Supporting The Tea Party Movement. He Actually Said That. Ari over at Media Matters asked Rupert Murdoch if it's appropriate for his network to be supporting the Tea Party movement. He said "no," and that they shouldn't support any party. He must have missed David Frum saying that Republicans actually work for FOX News. The goal of Murdoch and his uber-minion, Roger Ailes, is to undermine any Democratic administration or support any Republican administration -- and they have succeeded. It's all about winning the TV wars to both men; Ailes made it very clear that it's all about ratings when he was on ABC's This Week, which is why he lets Beck turn into an embarrassing lunatic and the network become transmitters of '90s type conspiracy theories. I wrote this about his appearance. If you read Rogers Ailes' dialogue on ABC's This Week, you will see just how entrenched his rhetoric is with what Fox News, the Teabaggers and the GOP puts on the air day in and night out. His own words are an indictment of his politics and the station he falsely calls "fair and balanced." In the process Ailes whipped up the most extreme right-wing nuts we have in America to such a frenzy that members of Congress are getting death threats on almost a daily basis lately. David and I have been following this story like nobody else and we've been predicting this type of behavior from the beginning. I hope I'm wrong, but if things keep escalating like they have been and with the help of the Limbaugh/Beck/Fox News Orkestra of Propaganda playing their paranoid Junta symphony--Doctor Tiller was just the warm-up act.